I think it’s safe to say that there hasn’t been a more hyped prospect since Stephen Strasburg in a long long time. Whether that’s a function of the increased media saturation or Strasburg really being the best pitching prospect ever, it is clear that most every baseball fan across the country was waiting with avid anticipation for his debut. Well last night against the Pirates, Strasburg made his debut. And with the saber community placing their bets, for drastic stakes, Strasburg blew past expectations. His final line was a thing of beauty: 7 IP, 4 H, 0 BB, 14 K, 2 ER, and achieved with a surprising efficient 94 pitches. Sure the Pirates are, ahem, not the best offensive team, but 14 strikeouts and no walks is impressive no matter how you slice it. More impressive that his results perhaps, was his stuff. The MASN gun had him topping 100 several times with his fastball and his offspeed pitches had boatloads of movement. Of course, I wanted to take a more quantitative look at his stuff last night. So I grabbed all of the Pitch f/x data from his start last night and had some fun with a lady named Excel. 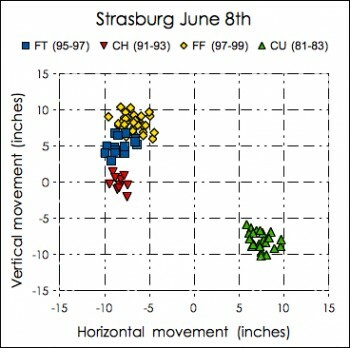 When looking at velocity, and horizontal and vertical movement, it appears that Strasburg threw four different pitch types last night: a fourseam fastball (FF), a twoseamer fastball (FT), a curveball (CU), and a changeup (CH). In the post game interview, Strasburg revealed that he considers his curveball more of a slurve and his twoseamer is actually a oneseamer. Go figure. 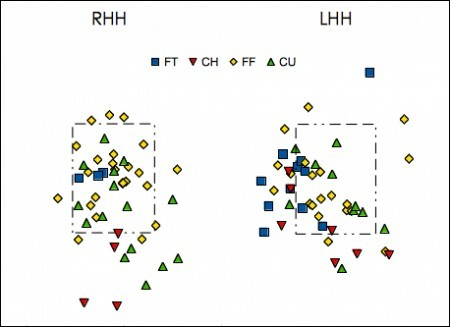 Anyway, the chart on the right shows each pitches vertical and horizontal movement compared to a pitch thrown without spin. This is from the catchers point of view, so fastballs will have negative horizontal movement and breaking balls positive. His obviously throws his fourseam fastball very very hard. At an average of 98.1 MPH with a high of over 100, his fastball would the fastest in baseball among starting pitchers. And while he may not be able to sustain that type of velocity over a full season, he didn’t lose any velocity as the game went on, striking out Andy Laroche on an 98.5 MPH fastball to end his start. His fourseamer has slightly more tail than the average fourseamer, but nothing special. His second fastball, the one he calls the one-seamer, has pretty standard movement to that of the average twoseamer – with the notable difference coming from his velocity. Thrown about two MPH slower than his heater, with a little extra tail and drop, it should be a decent secondary pitch with which to get groundballs. Despite throwing two different fastballs in the upper nineties, his changeup might just be his best pitch. Thrown about as hard as the average pitcher’s fastball he might do well to try and slow that pitch down just a bit, but with a solid speed differential compared to his fastball and absolutely sick vertical movement (about five inches more drop than the average changeup) there is little to complain about. He then follows that up with a curveball that might just be better than his changeup (which much just be better than his fastballs). I think most people would agree that Adam Wainwright has one, if not the, best curveball in baseball. According to FanGraphs, his curveball has averaged about 8 inches of horizontal movement and -8 inches of vertical movement this year. Well, Strasburg’s curveball averaged 7.4 inches of horizontal movement and -8.1 inches of vertical movement last night – and he threw it nearly 10 MPH faster than Wainwright does his. I could talk all day about Strasburg’s stuff, but there is not much more of a spin I can put on it. Barring some kind of Pitch f/x malfunction, he appears to have four plus plus plus pitches and mixes each of them generously. Of course stuff isn’t the only thing involved in rating a pitching prospect – location, pitch sequencing, and other things are also very important for pitchers. And while Strasburg’s stuff was exceptional without blemish, his location wasn’t quite as perfect. These charts are from the catchers point of view. Strasburg threw his fourseam fastball most often to each batter hand and pretty much just pounded the strike zone with it. Against righties he only threw two fourseamers out of 24 than weren’t right around the strike zone, and against lefties 12 out of 20 were in the zone. To righties he didn’t show much of a tendency, but for lefties he definitely tried to pound the outer half of the plate. He did leave a lot of fourseamers up, but given the overwhelming velocity on them, he wasn’t hurt at all. Not surprisingly, 32 out of the 44 fourseamers he threw went for strikes, with seven of them being the swing and miss variety. His changeup location was fantastic, with every single one of them down below the strike zone or just off of the plate, but given the insane amount of movement on them, batters couldn’t lay off. Of the 11 changeups he threw last night, eight went for strikes and four were swung on and missed. Interestingly enough, the one home run he allowed to Delwyn Young was on a changeup right at the knees – one of the few he threw in the strike zone all night. The one concern I had with Strasburg’s location last night was with his curveball. Although he got excellent results with it (18 out of 25 for strikes and only one going for a hit), a lot of the pitches were elevated in the strike zone. I’m a little on the fence regarding how to judge such pitches. On one hand, high curveballs are generally meatballs for hitters and I don’t think I’ve ever heard a pitching coach say “alright now you’re gonna wanna throw your curveball belt high and right down the middle on this pitch”. On the other hand, with the amount of movement Strasburg gets on his curve and the fact that hitters are all geared up for his 98 MPH fastball, those pitches might not be so bad to throw. Judging by knee buckling reactions of the Pirate hitters to that pitch, I would say that it was plenty good last night. I guess that’s all you can say about Strasburg’s debut. His stuff is off the charts good, and the Nationals couldn’t have asked for better results. Along with a win in the bag and attendance basically doubling last night, the Nationals couldn’t have asked for a better debut from Strasburg. And if he’s able to show the stuff that he did last night while continuing to improve his location and sequencing, he should rank among the best starters in baseball by the end of the season. THT Forecasts have Strasburg putting up a 2.68 ERA the rest of the season. A day ago that might have seemed a little bullish, but now it doesn’t look to crazy to me after witnessing his debut. Of course with all young pitchers there is the ever looming chance of injury, and at least to one analyst, Strasburg’s mechanics may not portend well for the future. However, mechanical analysis is a very inexact science and Strasburg could very well likely remain injury free. If that is the case then the Nationals truly have something special on their hands. Excellent breakdown Nick. I live in the DC area but don’t consider myself a Nats fan and am always skeptical about these can’t-miss prospects. But that was the most fun I’ve had watching a game in a while. Truly electric stuff, to use an overused adjective. You mention his pitches relative to the average. It would be neat to see the averages plotted as well for visual comparison. The movement plot looks pretty standard to be honest. (What, no slider?) except for maybe the change-up, as you mentioned. Looks like it could be a splitter, based on the absence of vertical movement, do you know if it is? In any case, what separates these pitches from average stuff is 1) the speed and 2) the ability to locate; things that you don’t see in the movement plot. Good point on the splitter/change-up John. During the broadcast they did mention speaking to Strasburg specifically about his splitter. I guess it’s semantics at a certain point. That’s interesting on the changeup. As you know, changeups (except for splitters) usually have positive vertical movement. To get zero vertical movement, the spin axis must be aligned vertically, which seems hard to do with a conventional grip/arm slot. I really think we should stop calling fastballs by their seam orientation. It just confuses the issue. The magnus effect is not affected by the seam orientation by any significant amount. The seam orientation is purely a mechanical artifact that allows the pitcher to put the spin he wants on the ball. IMO there are fastballs (fastballs with spin that is inline with the arm slot) and sinkers (fastballs with spin from a pronated release). However many seams are presented is not germane really except as a possible factor in pitch id by the batter. Matt, I mostly agree with you. But the problem that I have is that for a lot of pitchers the difference between their two fastballs is mostly that one tails more than the other. I hesitate to call something a “sinking” fastball when it has 10 inches of hop compared to 12 inches of hop on the regular fastball.